Award-winning author Philip Yancey takes you for a soul-searching look at two of Christianity’s most important topics WHAT’S SO AMAZING ABOUT GRACE? In this critically acclaimed, bestselling book, Philip Yancey explores the church’s great distinctive—grace—at street level. If grace is God’s love for the undeserving, and if Christians are its sole dispensers, then how are we doing at lavishing grace on a world that knows far more of cruelty and unforgiveness than it does of mercy? 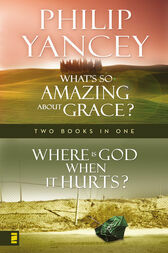 Offering compelling, true portraits of grace’s life-changing power, Yancey searches for its presence in his own life and in the church. And he challenges us to become living answers to a world that desperately wants to know, What’s So Amazing About Grace? WHERE IS GOD WHEN IT HURTS? If there is a loving God, then why is it that … ? You’ve heard that question, perhaps asked it yourself. No matter how you complete it, at its root lies the issue of pain. In this award-winning book, Philip Yancey reveals a God who is neither capricious nor unconcerned. Using examples from the Bible and from his own experiences, Yancey looks at pain—physical, emotional, and spiritual—and helps us understand why we suffer. Where Is God When It Hurts? will speak to those for whom life sometimes just doesn’t make sense. And it will help equip anyone who wants to reach out to someone in pain but doesn’t know what to say. Title: Where Is God When it Hurts/What's So Amazing About Grace?